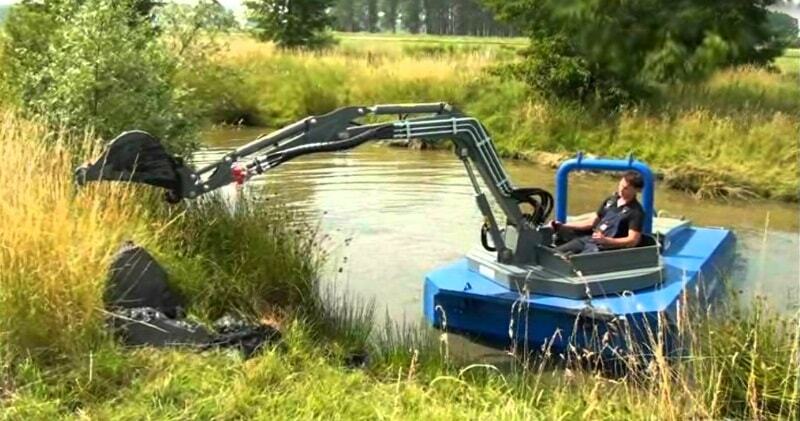 Home Technology The Conver C550, A Compact Amphibious Excavator! The Conver C550, A Compact Amphibious Excavator! The Conver C550 combines the digging performance of a 2 tonne excavator with amphibious characteristics and impressive hydraulic power. The machine can propel itself both on land as well as in the water and is suitable for many different attachments from digger bucket to dredgepump or from weed rake to weed cutter.The thumbnail in the video is mising but the video is playable. The Conver C550 is a robust multi-functional amphibious tool carrier for maintenance on land and water. This amphibious machine is super flexible and suitable for all kinds of mowing, dredging, retaining wall work and much more. The operator’s space is mounted on the rotating mast set so that the operator turns with the tool, similar to an excavator, and thus always retains visibility of the work. The operator’s area is hinged so it can be lifted out of the hull. This provides ease of access to components below deck for service purposes.